The American Congress is due to vote on whether to accept the Joint Comprehensive Plan of Action signed July 14 between Iran and the P5+1 group of world powers – the US, Britain, France, Germany, Russia and China. Republicans are openly vowing to reject the JCPOA, along with hawkish Democrats such as Senator Chuck Schumer. Opposition within the Congress may even be enough to override a presidential veto to push through the nuclear accord. In his drastic prediction of war, one might assume that Obama is referring to Israel launching a preemptive military strike on Iran with the backing of US Republicans. Or that he is insinuating that Iran will walk from self-imposed restraints on its nuclear program to build a bomb, thus triggering a war. But what could really be behind Obama’s dire warning of “deal or war” is another scenario – the collapse of the US dollar, and with that the implosion of the US economy. That scenario was hinted at this week by US Secretary of State John Kerry. Speaking in New York on August 11, Kerry made the candid admission that failure to seal the nuclear deal could result in the US dollar losing its status as the top international reserve currency. In other words, what really concerns the Obama administration is that the sanctions regime it has crafted on Iran – and has compelled other nations to abide by over the past decade – will be finished. And Iran will be open for business with the European Union, as well as China and Russia. It is significant that within days of signing the Geneva accord, Germany, France, Italy and other EU governments hastened to Tehran to begin lining up lucrative investment opportunities in Iran’s prodigious oil and gas industries. China and Russia are equally well-placed and more than willing to resume trading partnerships with Iran. Russia has signed major deals to expand Iran’s nuclear energy industry. American writer Paul Craig Roberts said that the US-led sanctions on Iran and also against Russia have generated a lot of frustration and resentment among Washington’s European allies. “US sanctions against Iran and Russia have cost businesses in other countries a lot of money,” Roberts told this author. Roberts added that if Washington were to scuttle the nuclear accord with Iran, and then demand a return to the erstwhile sanctions regime, the other international players will repudiate the American diktat. The US dollar would henceforth lose its status as the key global reserve currency for the conduct of international trade and financial transactions. Former World Bank analyst Peter Koenig says that if the nuclear accord unravels, Iran will be free to trade its oil and gas – worth trillions of dollars – in bilateral currency deals with the EU, Japan, India, South Korea, China and Russia, in much the same way that China and Russia and other members of the BRICS nations have already begun to do so. That outcome will further undermine the US dollar. It will gradually become redundant as a mechanism of international payment. Koenig argues that this implicit threat to the dollar is the real, unspoken cause for anxiety in Washington. The long-running dispute with Iran, he contends, was never about alleged weapons of mass destruction. Rather, the real motive was for Washington to preserve the dollar’s unique global standing. This is not just about Iran. It is about other major world economies moving away from holding the US dollar as a means of doing business. If the US unilaterally scuppers the international nuclear accord, Washington will no longer be able to enforce its financial hegemony, which the sanctions regime on Iran has underpinned. As Paul Craig Roberts commented, the dollar’s value has only been maintained because up to now the rest of the world needs the greenback to do business with. That dependency has allowed the US Federal Reserve to keep printing banknotes in quantities that are in no way commensurate with the American economy’s decrepit condition. Doug Casey, a top American investment analyst, last week warned that the woeful state of the US economy means that the dollar is teetering on the brink of a long-overdue crash. “You’re going to see very high levels of inflation. It’s going to be quite catastrophic,” says Casey. He added that the crash will also presage a collapse in the American banking system which is carrying trillions of dollars of toxic debt derivatives, at levels much greater than when the system crashed in 2007-08. President Obama’s grim warning of “deal or war” seems to provide an answer. Faced with economic implosion on an epic scale, the US may be counting on war as its other option. This entry was posted in All Posts News Politics and-or Videos, Economy, Iran, Nukes, Oil and/or Fossil Fuels, Politics and tagged Collapse, Finian Cunningham, Iran Israel US Nukes, Iran Nuclear Deal, Paul Craig Roberts, Reserve Currency. Bookmark the permalink. It’s beyond idiotic, Vera. It’s also a cryin’ shame. Go to the diners and the beer joints. Talk to Joe and Judy Sixpack. You’ll find out quick enough that blue-collar Americans truly are fascists but they’re ignorant of the fact. The longer I live the more convinced I become that laissez-faire capitalism is incipient fascism. Left to itself, it becomes the tyranny of the robber barons. We saw that in the 19th century. When progressive government intervened, attempting to ‘bust the trust,’ what happened was just the reverse; ‘regulated’ trusts gained inordinate influence over governmental regulators, and so we fought World War I — which we’re still fighting because it never ended. The upshot was one big, hundred-year war, all to benefit the money crowd. America left to itself will never make peace with the world because the majority of Americans, as I said at the beginning, see war as beneficial. War is good for business and business makes jobs and etc. America is convinced of that because America has yet to lose a war. America has never been bombed. America has never been conquered and occupied. If that were to happen, Americans will see the true face of war and, having once seen it, may come to see it as something short of a good deal. But we’re in for a rough ride because Americans will need a lot of convincing. My last, best words of advice are: Don’t ever fly commercial air again. Do you realize, do you have any IDEA how many MANPADS are loose in the world at this moment? I can’t believe none of them have yet been put to use! But soon. Soon. Thanks for your comment, Deke. I enjoyed reading your latest blog post of your book review. That’s one of the reasons I began blogging 10 years ago; corporate media is just that corporate. They lie to us by omission of the facts only giving their viewers/readers selected information. Vera lives in Europe, so she doesn’t have the opportunity to talk to “Joe and Judy Sixpack”. She has mentioned in many of her comments the same thing that you have about US citizens not truly understanding war because we have not been occupied by a foreign nation. Well, as Vera suggests ~ just a huge pile of rubble in the making, I agree; only this is the established imperial business model, the way the world of idiot policy is constituted…..first we destroy then we rebuild and reap a profit from both interventions. Money, money, money. As I see it either way with Iran and these lunatic “powers” it will be interesting to say the least. My reading is that it matters not a jot whether the “bank” trades in this or that denomination, what counts is the ethical constitution of the economy itself. Forget green, forget colour revolutions, forget slogans and never mind the brand; it’s about us, the human beings who determine our own destiny ~ we are the force that shapes and stewards our native habitat, not the fascist reflex of conditioned conformity. We have the strength and the entitlement, & we must stand our ground in solidarity to build our evolving planetary polity ~ through robust alliances that defend our right to resist this nightmare-phantom of corporate terror; by our ethical actions and our virtuous relationships we call its bluff. Individuals can duck and dodge and dance and dive; but the hallucinating behemoths of high finance & “total surveillance” are unwieldy and inert “institutionalized” templates of ignorance, gimmickry and habit, powered by assumptions of control & technologies of convenience. The “authorities” are intoxicated with their own propagandist deceits…. poisonous excretions & tumescent aggregates of reified prejudice and stupidity. Every human being on this planet is (inter)dependent in some way or other, and must live with “others.” How we do that informs us of who we truly are. Intelligence cannot be “appropriated” or “programmed.” It can only be cultivated and realised through the empirical operating systems of metaphysical tradition preserved by initiates, interpreted aright and understood from authentic experience, tempered in turn by spiritual syntheses modulated by ever-new epiphanies over time. Before we talk over much, we need to learn to listen. Before we act, we need to heed, to think & reflect, to gather our energies and consider our capacities. Unless we ground our experience in the truths of a natural world, a world that we know virtually nothing about, our thoughts are only transient vapours and conceits. To be really strong, and to overcome the oppression of circumstance, we must find the courage to stop, to contemplate the reality of things, if we are to successfully meditate a resilient and wholesome future shared by all beings….a creative future inspired by the joy of life, not enslavement to dogma. The language of intelligent change is encoded in our souls, it is up to us to access this knowledge, to comprehend it and exercise it. This is a very good post, very well written and explanatory. Finian is always enviably coherent. My own advice to US citizens who aspire to a better life, is to open up to the wider world, to share essential knowledge, share experience freely and ask the deeper questions ~ what do we need, why are we here, what actually governs reality? How do we exercise our faculties most wisely and benefit from the unprecedented opportunities that present circumstance offers us? This is totally IDIOTIC! 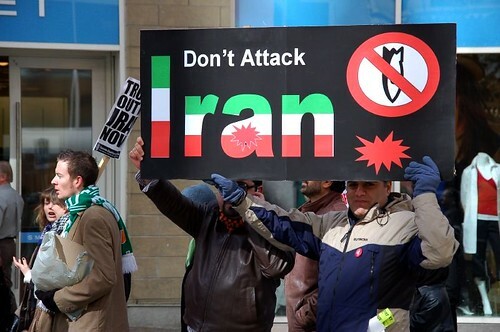 Why attack Iran? Because israel wants it? What has Iran done to the US, or israel for that matter. Must chaos and violence always be the way of solving problems? Creating even more refugees and what good does this do? The West MUST stop meddling where it has NO business before the entire world ends up being one huge pile of rubble.